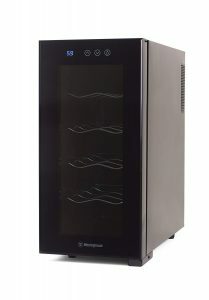 Black Westinghouse WWT100TB is a 10-bottle capacity thermoelectric compact and upright wine cooler with four chrome shelves that slide out easily. It has a sleek touchpad display panel that is easy to read with the thermostat adjustment, up and down buttons, a digital readout of the temperature in Fahrenheit and a light button. The rating is 4 out of 5 stars by 56 customers for the 10-bottle, 8-bottle and 6-bottle versions. Please check out the price differences on the Amazon.com product page and see which one suits your needs better. They are single zone wine coolers with the temperature adjustment between 54 and 66 degrees Fahrenheit. Being a thermoelectric cooler the 10-bottle cooler works very quietly at just 38 decibels. The four chrome wire are are solid enough to keep your wine bottles. This silver chrome finish adds to the nice look of this wine cooler too. The interior light will let you see your wine bottles easily before picking one and will help show them off nicely through the grey tinted transparent glass door that offers great light protection. The 10-bottle fridge has a very attractive design, weighs 26.7 pounds and measures 10 x 20.25 x 20.25 inches. It is hard for a lot of people to keep a large wine cellar due to cost and space restrictions. But this shouldn’t stop them from storing their wine bottle in a similar environment. And you won’t need much space on your counter or in your kitchen with this unit. 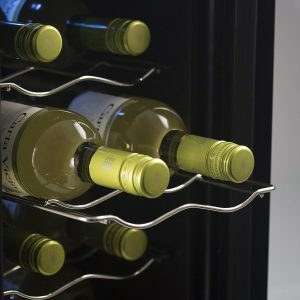 Your wine bottles will be kept at the optimal temperatures and humidity consistently. And the wine cooler works without any vibrations so that the naturally occurring sediments in wine bottles are not disturbed. It has an integrated configuration recessed door handle as part of this cooler’s space saving design. You can turn on an off the interior LED light via the display panel at the top of the door. The temperature on the display panel is what the user sets it to rather than the actual temperature inside the cooler, but pretty close to it anyway. As a thermoelectric cooler without a compressor this cooler will be able to reach temperatures 20 degrees below the room temperature. So it will depend on what the ambient temp is, which season or whether you have the AC on. How many bottles you put in it and how often you open the door will affect the interior temperature. You need to get a compressor type cooler if you’ll be using it in a hot room. This is not designed as a built-in unit and you need to have two inches on the sides and the rear and 4 inches at the top for air circulation. You can put your larger champagne bottles at the bottom as it would be a bit hard at the top. Overall it should meet most people’s expectations from a thermoelectric cooler. It is offered with a year of warranty by Westinghouse and their customer support will be happy to assist you in case of problems.